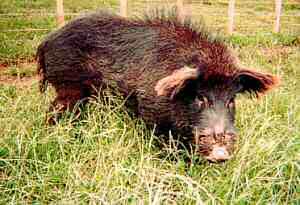 The Auckland Island Pig is a feral breed of domestic pig found on Auckland Island in New Zealand. The pig is believed to have inhabited the island since 1807, when Europeans made several various releases of domestic pigs to provide a source of food for stranded sailors or visiting whalers. By the end of the 19th century, the island held a thriving population of mixed origin pigs. In the late 20th century the largely undisturbed pig population produced a single distinctive breed know today as the Auckland Island Pig. The Auckland Island pigs appearance consists of a thick hairy coat that is black, white, and brown with black markings. They have a long narrow head and snout with a straight tails. They are relatively small in stature. The average weight of the Auckland Island adult boar is 41.7 kg, and an adult sow 37.3 kg. As of the late 20th century the substantial pig population occupied the whole of the island, with equal numbers of males and females. The pigs diet is a wide variety of different plants and earth worms. Pigs along the coastal areas also eat bark, invertebrates, and the remains of dead birds and sea lions. The Auckland Island Pig has had a considerable environmental impact on the island due to overpopulation. They have caused destruction of much of the islands’ flora, and have had a negative impact on the wildlife throughout the island. They have dug up birds burrows, and stolen bird eggs (petrels, albatrosses, mollymawks, penguins, and shags). In 1999, local governments tried to restore the natural ecosystems and to preserve the Auckland Island breed. An expedition caught and removed seventeen pigs from the island, including several pregnant sows, and transferred them to Invercargill, New Zealand. These pigs have since bred successfully in captivity and are no longer at risk.